Here's where we will keep you up to date on what's happening at RTF and on trails in the area. Drop us a line at rivannatrails@gmail.com if you have suggestions for news we ought to cover. After a two-year absence, the RTF newsletter is back! For our members and e-mail contacts for whom we have mailing addresses, look for a copy in your mailbox during the second week of December. For an advance look, click here for a pdf version. It's been a good year for the RTF and our network of trails, and with the support of our friends and volunteers the best is yet to come. The annual Loop de Ville has consistently enjoyed perfect fall weather, and this year was no exception. Leaving from Riverview Park at a dark and brisk 6:30 am, the group made its way through clearing skies and pleasant temperatures, returning exactly eight hours later. Thirteen people completed the entire circuit, including five who made the drive up from Richmond! Check out some photos here. 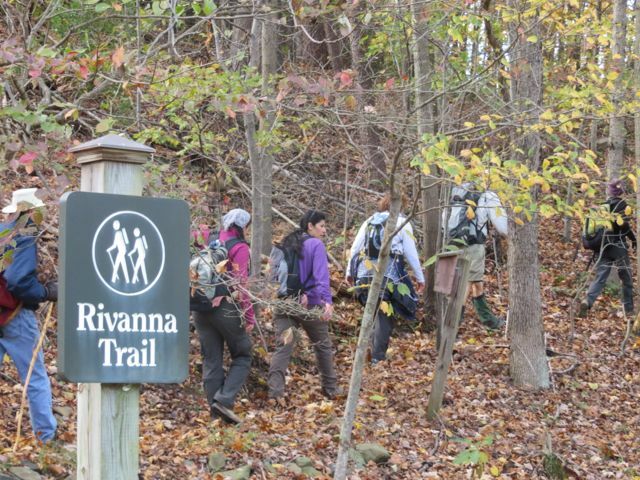 Boy Scouts and prospective Eagle Scouts are major contributors to the Rivanna Trail, and October saw the latest example. Andrew Heatwole (front) led a project that replaced a decaying and undersized bridge on Observatory Hill, one of the most-used segments of the Trail. As part of his Eagle Scout qualifications, Andrew designed the bridge, raised the funds to purchase materials, and organized a work party of friends and fellow Scouts. The new bridge went in on October 14. 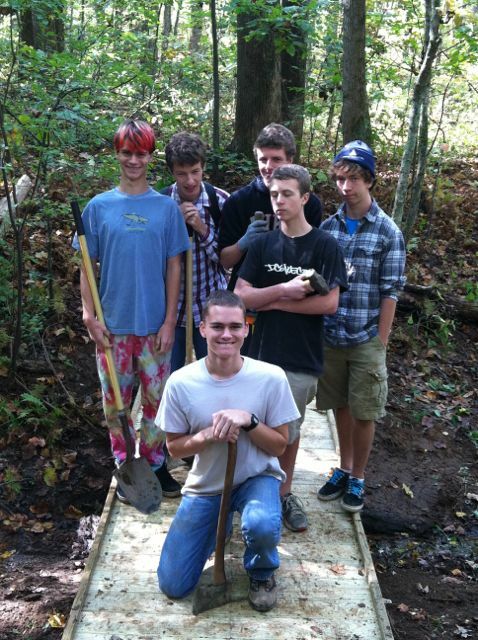 Thanks to Andrew for the improved bridge and for supporting the Rivanna Trail! Preliminary design of the “southern terminus” of the Route 29 Charlottesville Bypass with the Rivanna Trail inserted. Bypass is light yellow. Rivanna Trail is green. The RTF is grateful to generous landowners who have given permission to the public to walk on trails on their land, and we include in this list the Virginia Department of Transportation (VDOT). In our capacity as stewards of the land our trails traverse, the RTF has historically not made public statements about land use issues, but we wish to inform our members of the impact VDOT’s proposed Route 29 Charlottesville Bypass will have on the Rivanna Trail. Specifically the “southern terminus” of the proposed Bypass will lie near, along, or on the path of the Rivanna Trail behind UVa’s JAG, Law, and Business schools, from near Barracks Road to Ivy Road. As currently designed, the southern terminus has the potential to close off access to trail users permanently. Southern Terminus Concept Drawing, Sept. 26, 2011 (6 MB) to see the preliminary design of the “southern terminus” in the vicinity affecting the Rivanna Trail. On the above website, scroll down to “Skanska-Branch/JMT Technical Proposal, June 20, 2012” to see other preliminary designs of the Bypass. New Environmental assessment Aug. 23, 2012 (4 MB). Attend VDOT’s public information meeting about designs for the Bypass. Thursday, September 27th from 6 - 9 p.m. at Jack Jouett Middle School. Encourage VDOT to include the Rivanna Trail in their designs of the Bypass, to accommodate hikers and bikers in the region of the Bypass, and to protect trails. The Southern Environmental Law Center (SELC) has created a plan entitled “LetsGo 29” that brings together ideas that could be implemented in the Route 29 corridor, projects that done together would cost less money than VDOT’s Bypass and that would not impact the Rivanna Trail. SELC’s “LetsGo 29” plan references “Places 29 Master Plan.” This latter document encompasses the Route 29 corridor and includes multiple spot transportation improvements. The Places 29 Master Plan, created with public participation, was adopted by both the Albemarle County planning commission and the Board of Supervisors. The Trail's popularity continues to spread. The August 5 edition of the Richmond Times-Dispatch carried a great profile of riding our "urban oasis": http://timesdispatch.com/ar/2109212/. 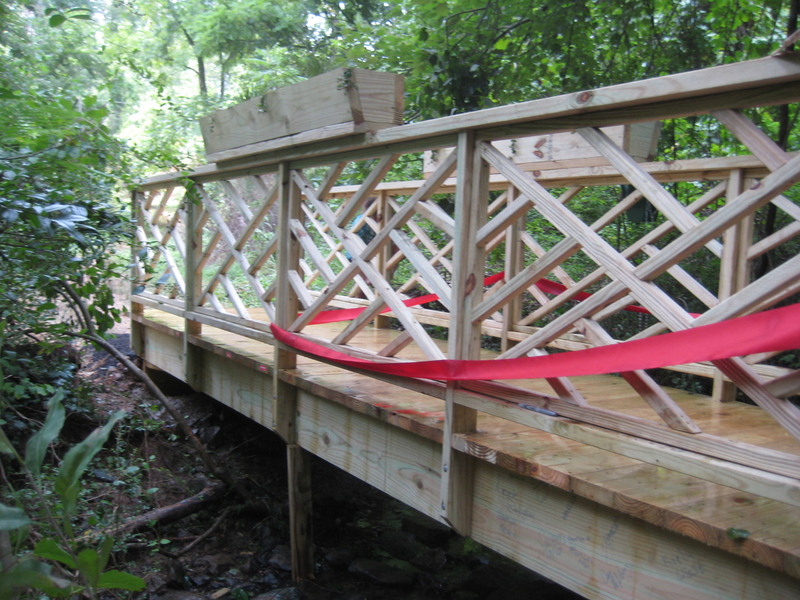 Students from the Village School have built a number of bridges on the Rivanna Trail over the years, and the ribbon-cutting for their newest was on Friday, August 3. The bridge, complete with appropriately-Jeffersonian railings, is located behind the UVa Law School on the trail segment between Barracks Road and Sandridge Road. The Daily Progress has a great story on the girls and their efforts. Thank you to all the students for their incredible work! July's work party tackled the trail segment between Avon Street and Route 20, including the spur into Quarry Park. The Avon Street end in particular is one of the toughest sections in which to keep vegetation at bay, especially in the fast-growing Virginia summer. Thanks to the hard work of our hardy volunteer crew, it's now fully clipped, weed-whacked, chain-sawed, and raked. Now is the perfect time to get out and explore one of the prettiest sections of the trail. 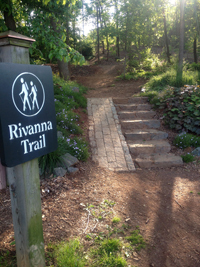 Local freelance author and trail enthusiast Jayson Whitehead has a terrific article in the current issue of the C-VILLE Weekly that features our beloved Rivanna Trail. Check out the article at this link. Several years ago the Charlottesville Area Tree Stewards (CATS) adopted the Barracks Road trailhead, an area that had for years been an attractant for beer bottles and fast food paper wastes. Thanks to their clear vision, careful planning, and dedicated work, the wonderful CATS folks have transformed this area into an amazing small arboretum of native trees, shrubs, and wildflowers. With a stream nearby and an additional rustic path, the small area is truly a gift to the community. The RTF thanks UVa for allowing the public to hike on this land and the CATS folks for their efforts. If you would like to adopt your favorite area along the trail, no matter how small -- even a single pesty multiflora rose bush as our dear friend Rosemary Ballister did for years -- just drop us an email note at rivannatrails@gmail.com and we'll advise. On April 21, 2012, the RTF lent tools and management expertise that empowered 23 young people from the Boys & Girls Club to build a brand new hiking trail in the Southwood community. An equal number of adult volunteers from Comcast and UVa mentored the young people, and together they cleared and side-cut a new trail, dug long-buried trash out of the forest, discovered new wildlife, and learned about teamwork. The new trail adds to a network of trails the young people had already built for their community and will eventually connect to Biscuit Run State Park. Look for our RTF tools in this NBC29 news coverage.